This post may contain affiliate links. Affiliate links come at no extra cost to you. These links allow me to share the products I authentically recommend (and use) and support Live Simply by receiving a small commission. Does a strong enough word exist to express the way I feel about chocolate? Without an adequate word, let’s just say the feelings I have for chocolate are intense (slight understatement). I get it, switching from processed food to a real food lifestyle can feel overwhelming and confusing. Friend, it doesn’t have to be this way. Last weekend while skimming through the recipe section of the blog, as I frequently do, I noticed a problem. I’m talking huge! Almost a misrepresentation of Live Simply and who I am. There is only ONE chocolate recipe, this one. One solitary chocolate muffin recipe. Here I have been blogging and sharing recipes and you are probably thinking I feast on beet smoothies, kale chips, and butter (you know my deep affections for butter) all day. I assure you, I do. I do eat these foods and crave them, but then there’s chocolate! Has there ever been a day in my life I haven’t dreamed, ate, drank, or in some way thought about it? Absolutely not. Chocolate is just one of those things. One of those heavenly things that just tastes so right, how could it ever be wrong? At least that’s what this girl is sticking with and my taste buds heartily agree. Now, when I make food, I can’t just make say mac and cheese or a smoothie without packing them full of nutrients. When I make or create a recipe I am always looking to get the most “bang for my buck” or however you would say that as it applies to nutrients in food. I want to pack the most nutrients possible in the recipes I feed my family. My gracious family has become slightly suspicious. “What’s really in here?” I get the looks. But when something tastes fantastic and delights the senses, they quickly forget mom “sneaks” ingredients in just about everything. In my defense, I don’t believe in just sneaking ingredients without my taste-testers knowing exactly what they are enjoying. Sometimes I wait till the second sip or bite, but I always tell. I want my family to appreciate the food we eat and understand a food that was once feared can taste amazing when prepared in a variety of ways. When I make brownies, or in this case Raw Brownie Bites, I approach them with the same mindset, “Hmm, what can I pack in here? Beets?” Just kidding on the beets. I haven’t totally lost it to beets, yet. Behold, the power of chocolate, my friends. These little treats packed with an avocado, walnuts, coconut oil, and other goodies, make these brownie bites not only tasty and chocolatey, but also nourishing. These are super easy to make and require only a few minutes of time spent with a trusty food processor. These little treats are also perfect for little hands to make and of course, eat! I need these in my life. And of course, avocados, and all the goodness tucked away in these bites, but most of all I need chocolate. At least for a mom it is. These little treats packed with an avocado, walnuts, coconut oil, and other goodies, make these brownie bites not only tasty and chocolatey, but also nourishing. Add the walnuts and dates (pitted) to the food processor and pulse for a minute or two until they are finely chopped and begin to stick together. Add in the remaining ingredients (except the toppings) until all the ingredients are blended together. The brownie "dough" will stick together and be moist. 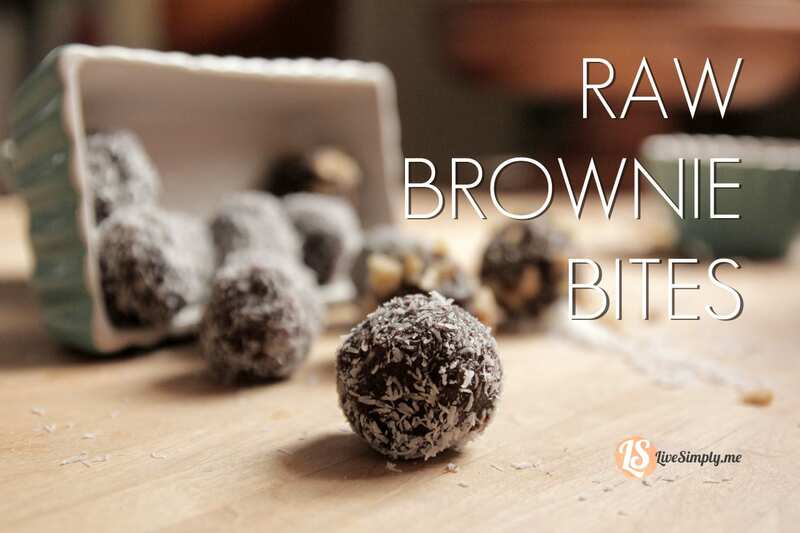 Remove the brownie "dough" from the food processor and form into a ball. Break off small chunks of the "dough" and roll into small bites ("balls"). Roll the "balls" in the toppings of your choice (or sprinkle if using sea salt). Once rolled, place the brownie bites in the fridge. This will allow the coconut oil to firm-up creating a delicious fudge-like brownie. I’ve made similar recipes that contain dried cherries—yum! Never tried one with avocadoes, though. I wonder how it would work to add peanut butter…. Thanks for sharing! Can’t wait to try this recipe! Peanut butter may make these a bit too creamy, I might decrease the avocado or coconut oil if you add peanut butter. Cherries sound wonderful! Yum. Thank you for sharing. My preschoolers and I made these and they were great. We were just short of dates and added a couple of prunes. We also only had one cup of walnuts so we added a cup of sunflower seeds and just a little sugar for more sweetness. Thanks for the recipe! Yay! Sounds like you made some wonderful substitutions! Thank you for sharing. So, could the dried cherries be a substitution for the avocado? I’m deathly allergic to avocado. Any other subs for that? You can make them without the avocado and they just turn out just as yummy. If the mixture is a bit dry I’d add a little bit extra coconut oil. How cute is the little boy in your pics!!!! 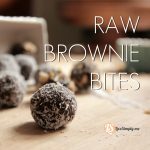 My daughter and I were looking for raw brownie recipes and found this post. Can’t wait to try this recipe! Thanks for sharing. Thank you. I think he’s pretty cute too ;). They are delicious and very kid-friendly. How far in advance can I make these? Will they last a few days in the frigde? I’d like them for a party treat. I am also wondering if I should leave out the avo. On the one hand it is a great nutrition powerhouse on the other my target market is 3 year olds and I wonder what it does to the taste. I will try with I think. These will last about a week with the avocado. With the cocoa in there you can’t taste the avocado at all. You can leave it out. They will just be a bit more dry. Much more like a Lara bar texture. how many brownie bites does this recipe make ? Around a dozen, depending on the size you make them. Are there any suggestions for substituting the walnuts? My kids school is a nut free schoo. You could try a seed. I’ve never tried substituting, but a seed would probably be the best option. Thank you for the recipe! I just made these with my 17 month old and we both loved them. I had to sub agave for the honey so the dough was very wet so I just added a handful of hemp seeds to dry it out. 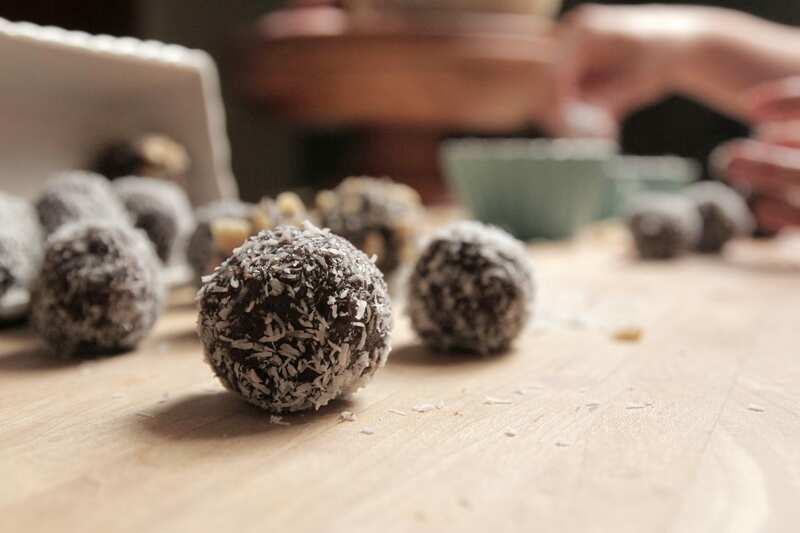 I rolled half of the balls in coconut and half in hemp seeds. What a great snack or dessert! Hi Leslie, Yummy! Sounds fantastic. So glad you liked them. I have a question for you. Ours turned out a bit oily and like the oil separated from the avocado or something. Any ideas on what to add to soak it up, I’d hate to waste this much. Hi Jennifer, I’d add more nuts and all should balance out. Hey Jen, I’ve never tried freezing these, but I think they would freeze well. The only issue I can possibly think of would be the avocado and the bites getting mushy, you could always leave the avocado out to freeze, if that’s an issue. What can you use instead of coconut oil? My husband does not like anything coconut. I don’t like nuts, is there any way I could do this recipe without them? I’m sure that it wouldn’t effect it, right? Hey Molly, Seeds may work in place of the nuts :). Why are people so trusting of what they eat outside the home, but suspicious of the food prepared inside the home. Not to suggest their suspicions should not be heightened there too! It’s about how pure the ingredients are. They should not be combined to enhance the flavor of the ingredient used in the recipe. Therefore no binding, preservative or coloring need to be added. Thanks for sharing, Brenda. Enjoy the Brownie Bites! Can I use butter instead of coconut oil? Hey Lesley, Butter may work, but you’ll need to keep them refrigerated for sure. Would it be alright to leave out the honey? Really trying to reduce sweetning to only the dates. Hey Rae Ann, I’m not 100% sure, but I think the bites will work without the honey! I just made these for the second time and they’re fantastic. 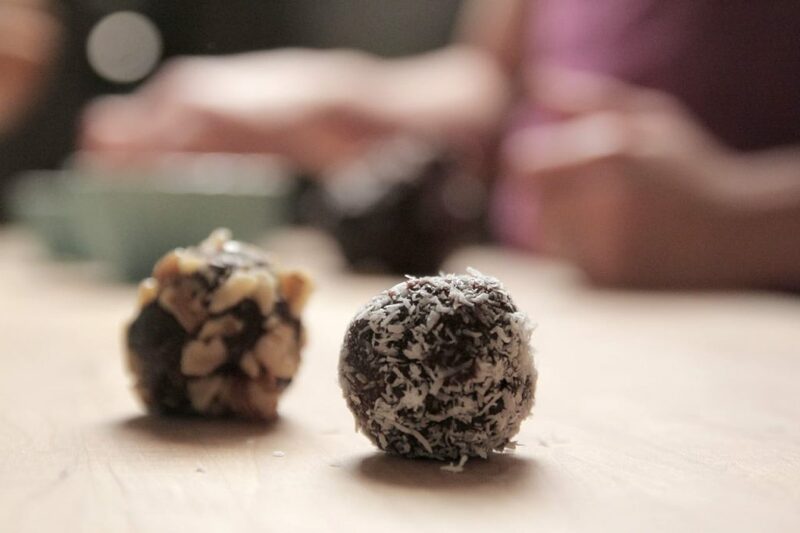 We used to make coconut date balls but these are so much better. Last time I made them as written minus the honey. This time I didn’t have enough walnuts so I just mixed a few different kind of nuts together, left out the honey again and rolled them in crushed brown rice crispies, unsweetened coconut shreds and sprinkled turmeric on them. So perfect. The kids LOVE them. These are sooooo good! I used the exact recipe. It made 20 good size brownie bites. I found that if I put them in the fridge for 15 minutes before I rolled them into balls, they were less messy. Do you know approximately how many calories would be in one ball? I’m not quite sure about the 3114Kcal. Hey Mary, I’m so glad you’re enjoying them. I updated the calories. That was for all 16 bites or balls. It’s around 194 calories per bite, if you get 16 bites out of the dough. I’M KRISTIN. 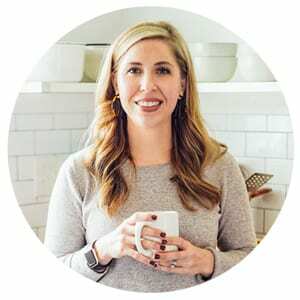 I’M HERE TO HELP YOU SIMPLIFY REAL FOOD AND NATURAL WELLNESS. BECAUSE NOURISHING YOURSELF AND YOUR FAMILY SHOULDN’T BE COMPLICATED. I’m Kristin. 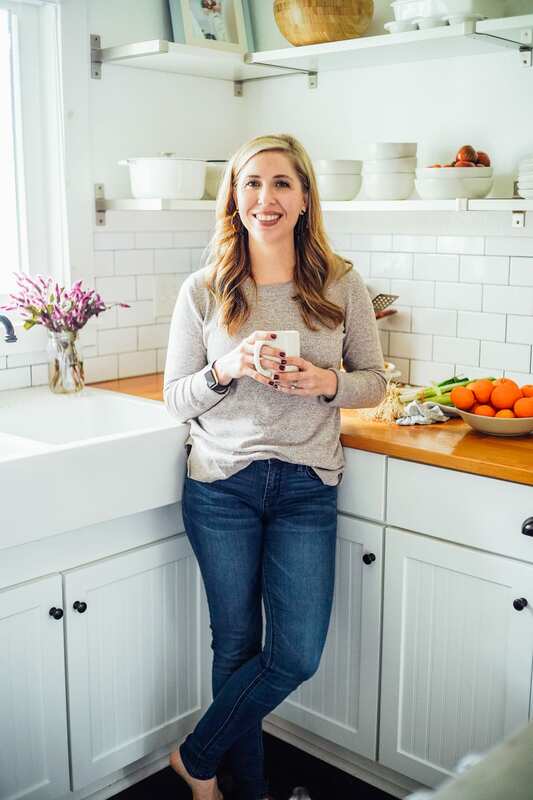 I started Live Simply to share my family's journey toward a real food and natural wellness lifestyle. Now, I help families all over the world do the same, one small step at a time. I believe nourishing yourself and your family shouldn't be complicated. Let me help you simplify! The DIY recipes on this website are based on my personal experiences. I am not a trained chemist, cleaning specialist, or skincare expert. The DIY recipes shared on this website haven’t been tested in a lab. Information about my products or recipes haven’t been evaluated by the Food and Drug Administration. This information is not intended to diagnose, treat, cure, or prevent any disease. Please consult a doctor or specialist for specific concerns about any skincare issues, cleaning products, or dietary needs. Please use your discretion, based on your own research, when making homemade products.